Since we are looking for some places to possibly have one of the snowiest and or coldest Februaries in our recorded history I thought we should begin a thread to see what milestones are set and what is needed for this to be the new February gold standard. Please limit posting to data which pertains to official weather stations only. It is fine to include well known co-op stations as well. I will delete any posts that do not fit this criteria. I will post some detailed information in this thread during the course of the weekend. Anyone can feel free to get the ball rolling! We can start with official readings of 3 in Arlington, and -8 in Yakima from this past week. The Yakima reading was a late season record for the airport (1946-). 14.3" so far here. Wouldn't be surprised at all to see a monthly total of 24-30" here. PDX is sitting on a 36.2 average for the month to date, which would be their third coldest February on record (behind 36 in 1989 and 35.8 in 1956). That should more or less continue to be maintained or even pulled further down for the foreseeable future. OLM's coldest February on record is 1989, at 33.2. They are currently at 31.7, before today. Is it alright to post Western/Central Montana stats as well? Definitely tracking a historic month out here as well which is what makes this month so amazing with how widespread it is. As mentioned before, Havre has already dropped as low as -41F and which was the coldest temp on record for this late in the year and has the potential to get even colder than that late next weekend. -25F at Bozeman airport so far and Bozeman has a real chance at breaking 1936 for the coldest February on record with an average temp of 5.1F. They currently sit at 11.3F through yesterday before this latest Arctic push. Two more February SEA snowfall records that will likely be broken: snow depth and days with snow on the ground. - Max snow depth came in 1990 with 7", and that's how much SEA has on the ground now, with more on the way soon. - Max number of days with snow cover is 9, from 1949. SEA is sitting at 5. Excellent points! They could break the record for most 32 and below and below 40 max temps also. One more SEA record that has a chance to fall: # of sub-40 days in February. 1949 holds the record with 13. 2019 is currently at 6. I'll be that guy, but KHVR hit -44 on 2/8/1994. So, the -41 on 2/7/2019 was second latest. Their truly amazing late season record is the -41 on March 13, 1897 at the town COOP. Please anytime, this is why you're the "statman"! Might all be moot since at this point there looks to plenty of other arctic surges to come in the next 12+ days. Appears almost certain Seattle will break their February record in the next few days. PDX with 6.3" so far this month. I would be surprised if PDX doesn't see some more snow in the next week. Salem has seen about 3-4", unfortunately they don't record snow stats anymore. This is perhaps slightly off topic, but I've been wondering this for a while. Why doesn't every official station (at least airport) measure snowfall and depths? It seems like it wouldn't be that hard to do, but there are even gaps in the SEA data. Automated observation stations. They need a human to measure snow. They renewed measuring snow at SEA because it was considered important enough. Portland could possibly see 2” of rain tomorrow. This would easily smash the Feb 11 record and get close to the one day all time record for February. Lows of 3 in Arlington, 5 in Olympia, and 7 in Bremerton this morning. Pretty incredible stuff, especially for February 10th. Most rainfall in one day for Portland in February is 2.16" in 1996. Any chance at being broken tomorrow? I believe the record is 2.19 on February 5th, 2017. The setup actually seems quite similar, so perhaps we could see 1.5 inch+ totals. Monthly snowfall record set for SEA! The 14.1" they have received so far breaks the record of 13.1" from 1949. Very high chance they will break the record for most days with 1" or more snow depth for the month of February as well. Hopefully SEA can pick up enough snow today to push over a 7" snow depth for the monthly record. They're currently at 6", with plenty of compaction from the last couple storms, so I'd be surprised if they don't manage it. They did it! Up to 8". 8 straight sub-40 highs for SEA. Another February record. This is down to 30.4. Long way to go, though. Hillsboro breaks its rainfall record with .97” but Portland didn’t with .65”. Seattle Sand Point set a new February record low of 18, then tied it again. This isn't hard to do since their period of record is less than 30 years long, but still cool! Also, their snow total is 11.4 inches, which I believe is their snowiest month since December 1996. Hillsboro apparently got 1.85" of rain today. It doesn't seem right considering that Portland got 0.71", every other valley location got under an inch, and even Astoria barely has an inch, but if it is right, it's definitely a record setter. Pretty sad the very small number of stations recording snowfall these days. One of the few that is did this month in western WA besides SEA and Seattle WFO is Monroe. They had 26.2" as of yesterday it looks like. YESTERDAY. THIS BREAKS THE OLD RECORD OF 5.5 SET IN 1897. AIRPORT YESTERDAY. THE RECORD OF 12 SET IN 1981. What did Seatac end up at snowfall wise? 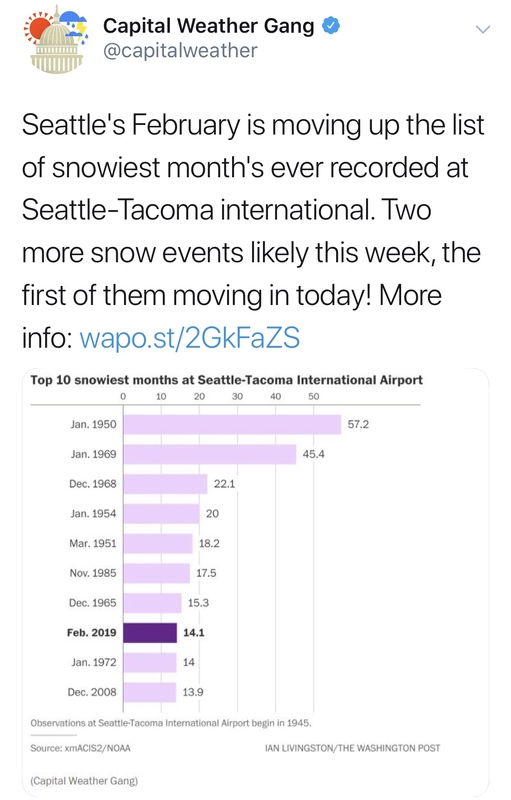 And SEA didn't report snowfall for a period of years in the 90's and 00's. * It's why Dec 1996 is missing from the list of top snowfall months. Overall, the most recent event felt a lot like 1996 to me. A once in a generation event. I think Dec 1996 was around 21", very comparable to Feb 2019. * They considered it "not important," which to me sounds ludicrous. Sure, it doesn't snow very much in this climate, but when it does, it often has a severe impact on air travel. YESTERDAY. THIS BREAKS THE OLD RECORD OF 1.1 SET IN 1981. YESTERDAY. THIS TIES THE OLD RECORD OF 29 SET IN 2006. TODAY. THIS BREAKS THE OLD RECORD OF 1.1 SET IN 1981. TODAY. THIS TIES THE OLD RECORD OF 29 SET IN 2006. AIRPORT YESTERDAY. THIS BREAKS THE OLD RECORD OF 24 SET IN 1982. YESTERDAY. THIS BREAKS THE OLD RECORD OF 26 SET IN 2001. AIRPORT YESTERDAY. THIS BREAKS THE OLD RECORD OF 20 SET IN 1994. YESTERDAY. THIS BREAKS THE OLD RECORD OF 15 SET IN 1982. AIRPORT TODAY. THIS BREAKS THE OLD RECORD OF 24 SET IN 1982. TODAY. THIS BREAKS THE OLD RECORD OF 15 SET IN 1982. AIRPORT TODAY. THIS BREAKS THE OLD RECORD OF 20 SET IN 1994. A RECORD LOW TEMPERATURE OF 18 DEGREES WAS SET AT SEATTLE WA WFO TODAY. THIS BREAKS THE OLD RECORD OF 26 SET IN 2001. You can keep going with this all the way to the beginning of the event. Yeah, Dec 1996 was fairly similar for Seattle for total snowfall. However, that event only lasted a few days and was basically two huge snow dumps. This event lasted over a week and featured 4 separate snowstorms. And a lot more record cold. It also occurred in February. So overall, I think Feb 2019 was easily more impressive from a historical perspective. December 1996 was a fair bit snowier for the city though. 17.9" at Sand Point and 22.5" at the downtown site. For Seattle. For the North Sound, the 1996 event started 6 days earlier and had a lot more snow and a white Christmas. I know Sand Point recorded more in 1996, but judging from some of the totals by posters here in Seattle, seems like a lot of them got close to what SEA got. Remember, with the last storm much of Seattle didn't switch over from snow until at least a couple hours after SEA did. Sand Point was definitely on the low end for a couple of the storms this month that actually favored areas further south and west in the city. Yes. This discussion was about Seattle. I don't think downtown has had anywhere near 22" so far this month. Probably more like 10-15" on average judging from reports. The accumulations with the Monday storm were definitely pretty elevation dependent. Eh, it's hard to say when you're not comparing the same exact spot. I doubt SEA had more snow in Dec 1996, maybe about the same. 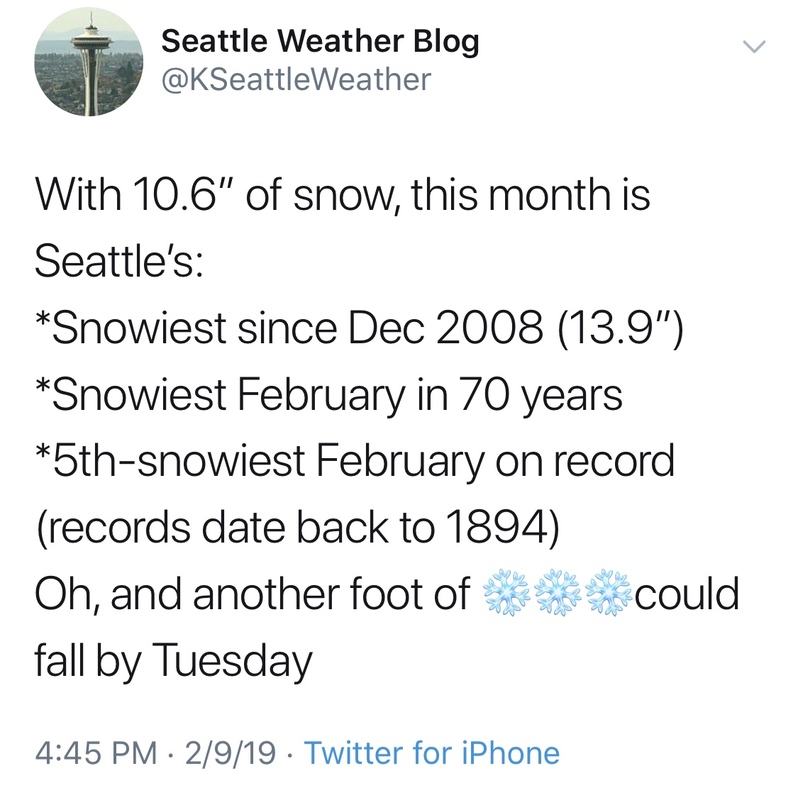 And there were reports of anywhere from 15-25" around Seattle from people on here, which sounds pretty comparable to 1996. Wow, the updated stats show Monroe has now received 37.3" of snow this month. Their snowfall records are spotty, but that's the third snowiest month on record for them, behind only Jan 1950 and Jan 1969. Beat Dec 2008 by 8". SEA was on the southern edge of the 12/26/96 action though. A lot more snow fell just north with that. And SEA still had about 18" that month, I would guess.